If one is going to trade the markets this week, one is going to have to play the retail game. Black Friday approaches this Friday, though Black Friday has really become nearly as cyber as Cyber Monday. With an early Thanksgiving this year, the holiday shopping season stretches out over five weekends. That is usually taken as a positive. It may also mean that as the season drags on, retailers will resort to deep discounting in order to reduce remaining inventories. That would pressure margins and create, even if sales were considerably higher, a level of margin pressure that would develop into an overall sloppy performance by the group creating winners and losers. Speaking of winners and losers, last week, markets reacted poorly to rather solid earnings results form the likes of Macy's (M - Get Report) , Walmart (WMT - Get Report) , and Home Depot (HD - Get Report) as retailers in general were slapped around. This week, we'll hear from Best Buy (BBY - Get Report) , Kohl's (KSS - Get Report) , Ross Stores (ROST - Get Report) , Target (TGT - Get Report) and TJX (TJX - Get Report) , among others. Do I think there's some value here? Yes, I actually do. I mentioned last week that I was adding to KSS, and I did. That name trades at just 13x forward-looking earnings, has transformed itself into an ally, and not a target, of a firm like Amazon (AMZN - Get Report) . You know I like the management here and think the name unfairly beaten on with the group. This week, however, I am thinking about Target more than I usually do. I had long ago chosen the already mentioned Amazon and Walmart as favorites over this name, but Target has hung tough with the big kids. Can TGT see same-store sales growth of 5%? That would dwarf Walmart's performance. Can the firm maintain the 35% pace seen earlier this year in e-commerce? Is Target able to capitalize off the demise of Toys R Us? Let's see what we can see. The digits are due on Tuesday morning. My thought is this. I really do not want to run out and purchase the equity today at market prices with earnings due on Tuesday. Keep in mind that the name will trade ex-dividend tomorrow as well, so if you do want the quarterly payout of $0.64, today is the day. 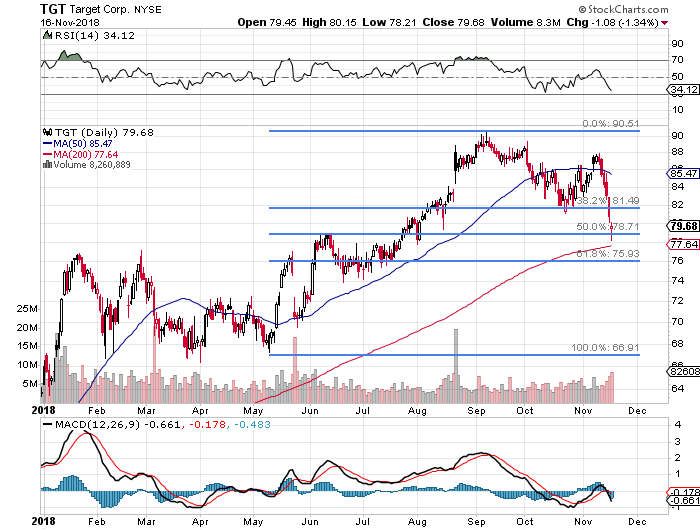 All that said, there does appear to be likely support in the $76 area, with cause for resistance above $85. Notes: The initiation of the "bull call spread" coupled with the sale of the put with a strike price at what I see as possible support accomplishes the most important mission that any trader can possibly ask of his or her set-ups... it pays for itself. In this scenario, a last sale above $80 by Friday would be profitable, while this trader would have to pony up for the shares should the last sale decline below $76 by Friday's closing sale. At the time of publication, Stephen Guilfoyle was long M, WMT, HD, KSS, AMZN equity and short M calls.